Switch is a digital device for logical interconnection of computer networks operating in the data link layer of OSI model. Switch interconnect network segments. 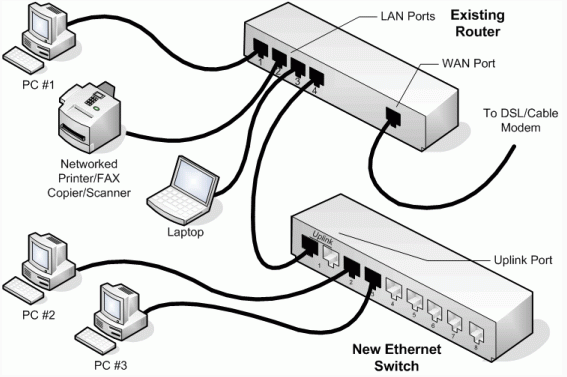 Previously we wrote about Router and KVM Switch for Server. Switch is used when it is desired to connect multiple networks, fusing them into one. These are basic hardware components of Network Computing, without knowing a small detail, it is difficult to work on Grid Computing or Distributed Computing dedicated for one big project, because practically if they are from the university, regardless of the research field, you will find, the knowledge is becoming a bottleneck. We are giving stress to the phrase Switch in Network Computing instead of only Switch for a simple reason – there are electrical switches used as consumer product for home usage. Bridge and switch are connected to each other but user always have to make it sure that there is a single path between two points on the network. Failure to follow this rule, forms a loop in the network, which produces infinite transmission of frames from one segment to another. Generally these devices use the algorithm spanning tree to prevent loops, making data transmission safe. Switch have the ability to learn and store the network address of the layer 2 ( MAC addresses; related to hardware, nothing to do with Apple Mac) of devices reachable through each of its ports. For example, a computer connected directly to a port on a switch causes the switch to store the MAC address. This allows, unlike hubs , information to be directed to a device so that it goes from the source port to the destination port. In the case of connecting two switches or switch and a hub, each switch will learn the MAC addresses of the devices accessible through its ports, thus interconnecting the port of the MAC is stored in the other switch devices. One of the critical points of these system are loops, consisting of two different paths to get from one computer to another through a set of switches. Loops occur because the switches which detect that a device is accessible through two ports for both way creates the confusion. This process causes each frame to be multiplied exponentially, to produce the so-called flooding the network, thus causing failure of communication. Considering the routing method used,depending on how subnet segmentation is done; the classification of switch is done. As practically this is not a reference article and the classification will create confusion to an average user, we have purposfully omitted this part. You can buy any text book or hand book on network computing in case you need to know about the classification. This Article Has Been Shared 3533 Times! MacBook Pro (MBP) is the Macintosh 13″, 15″ and 17″ Notebook Computers manufactured by Apple. MacBook range was started on 10th January 2006 by Steve Jobs. Cite this article as: Abhishek Ghosh, "Switch in Network Computing," in The Customize Windows, December 17, 2012, April 23, 2019, https://thecustomizewindows.com/2012/12/switch-in-network-computing/.